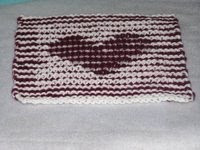 This Illusion Heart Wash Cloth seemed like it would be a lovely thing to make. 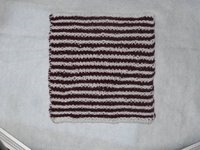 It requires two contrasting colours of yarn and knitting and purling while following a pattern. When you look straight down at the wash cloth it is striped. When you look at more of an angle you can see the heart. It was there all along -- disguised by the stripes. As I was knitting (and watching the heart start to appear), I realized something. There are times when I 'wear my heart on my sleeve', but most of the time my cheerful facade hides my heart -- protecting it from the prying eyes of onlookers and casual acquaintances who feign friendship. What a cute washcloth- & a wonderful reminder to take times to see what is really in the hearts of others! it's so true, and you are so talented! Wow! This is cool! I'm a heart-hider, too. And I liked your comment about house cleaning. DITTO! The heart is awesome, you are one talented girl! When Im stressed I like to read or clean! Great post thanks!